Everybody remembers the comic book where Mr. Spock does the Vulcan nerve pinch on Wolverine, but what about the other Star Trek/X-Men crossover? The impossible-to-punctuate Star Trek: The Next Generation, X-Men: Planet X, by Michael Jan Friedman, was a delicious little novel in the late nineties that stands out for its prune juice, its characterization of Wolverine as a guy who says "Yer darn tootin'," and its prescience about Jean-Luc Picard becoming Charles Xavier's doppelganger. Here's what happens in this overlooked gem: On the planet Xhaldia, regular men and women are developing strange powers. They're feared and hated by the population, and a strange powerful force seems to be after them. Sound familiar? It does to a group of the X-Men, who are suddenly sucked into this world and hitch a ride on the Starship Enterprise. What follows is a good deal of explanation about who the X-Men are and what the Federation is, and then a jumble of personalities. Picard bonds with Storm over tea, and they talk about the problems of leadership, but he finds Archangel too reckless for his tastes. Nightcrawler and Geordi seem to hit it off. Wolverine and Worf fight enemies on the holodeck and drink prune juice together. Yes, prune juice. It all begins after the first work out on the holodeck when Wolverine comes sauntering into the lounge and orders a drink from Guinan. Geez louise, he said. "You call this a drink?" "Actually," she replied, "It's the strongest stuff we serve around here." "This may be fine for yer Starfleet types, but I'm in the market for something with a kick . . . . The sort of stuff yer friend Worf might cozy up to." "Prune juice," Guinan said, smiling. "A warrior's drink. . . . Unless, of course, you're not the warrior you say you are." "You are feisty," he told her, with just a hint of admiration. "Takes one to know one," the bartender noted. So now we know that Wolverine was extremely regular for the rest of his trip. Maybe that's why he seems like he's always in a good mood. Through a mix of mutant powers an futuristic technology, they figure out why exactly 'mutants' are turning up on alien planets and derail the forces that come after them. The mutants on Xhaldia are saved. 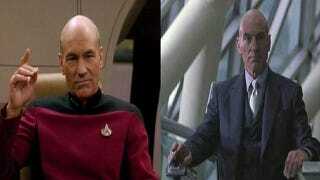 Captain Picard and Archangel learn to respect each other. Data sings duets with Banshee. Storm drinks more tea. But the real centerpiece of the book is when Beverly Crusher learns to use the brain scans she took from the mutants to make a holodeck Professor X, and at the end, Captain Picard comes to meet him. [He] turned his gaze on the Captain, and a flicker of something like amusement crossed his features. Nor was it difficult for Picard to see why. As the doctor had warned him, he and the Professor bore a passing resemblance to each other. Xavier . . . studied Picard more closely. "Mon semblable, mon frere," the Professor said. The Captain raised an eyebrow, "The Wasteland, I believe." They talk a little about Eliot and how awesome the Professor is, and then Picard ends the conversation to head to the bridge and shout 'engage,' at anyone who'll listen. The day has been saved, there's a cameo by Q and The Watcher, and life continues on as normal for both continuities. The Professor's hologram, at the end of the conversation with Picard, tells him to feel free to access the program again at any time. If your mind didn't immediately jump to a play, a movie, or an HBO mini-series that is only Picard and Professor X having conversations, both played by Patrick Stewart, you never loved either of these series. We need to make this happen.